Question: I have two PDF or postscript files (I can work with either one). What I want to do is merge each page on top of the other so that page1 of document A will be combined with page 1 of document B to produce page 1 of the output document. This isn't something I necessarily want need to do programmatically, although that would be helpful. Is there any solution one VeryPDF? Answer: According to your needs, maybe you can try to convert PS file to PDF and then overlay PDF. 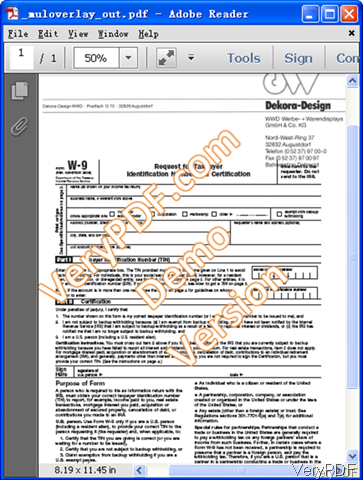 For converting PS to PDF, software Postscript to PDF Converter can help you do that. For overlaying PDF, software VeryPDF PDF Toolbox Command Line can do a perfect job. Both of the two software is free trial and command line version software, even if you need to do those job programmatically, you can also make it. Please check more information of those software on homepage, in the following part, let us check how to use this software. Download Postscript to PDF Converter Command Line. When downloading finishes, please extract it to some folder then open MS Dos Windows and call it. Please check related parameters and more on homepage, as here I can not list all of them. Please download PDF Toolbox Command Line. And call this software by the same way with the first one. There are three versions of this software: Mac, Linux and Windows. Please download the proper version according to your needs. When you need to overlay PDF, please refer to the following command line templates. 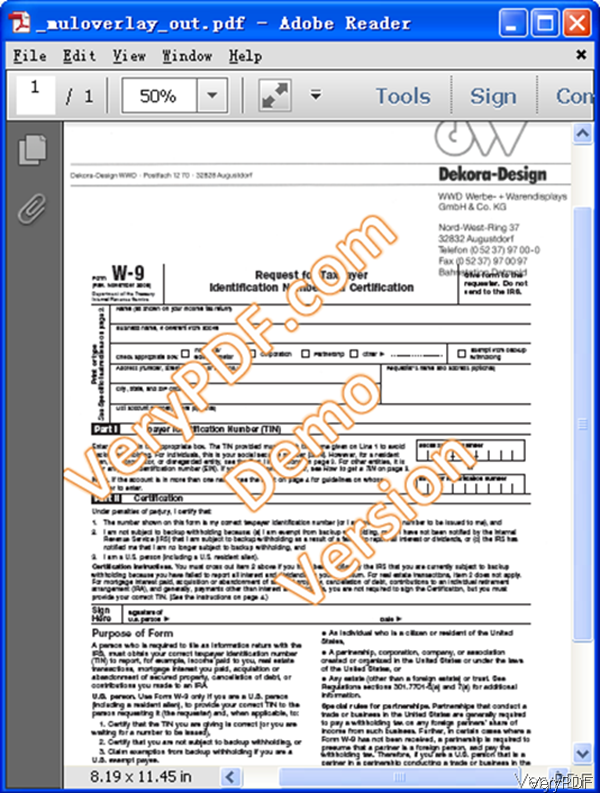 pdftoolbox sample_in1.pdf -overlay sample_fillform.pdf -outfile "_overlay_out.pdf"
pdftoolbox sample_in2.pdf -muloverlay sample_fillform.pdf -outfile "_muloverlay_out.pdf"
pdftoolbox "sample_fillform.pdf" -mulunderlay sample_in2.pdf -outfile "_mulunderlay_out.pdf"
-underlay : apply the first page of the background PDF to the background of the single input PDF. -mulunderlay : apply each page of the background PDF to the background of the corresponding page of the single input PDF. 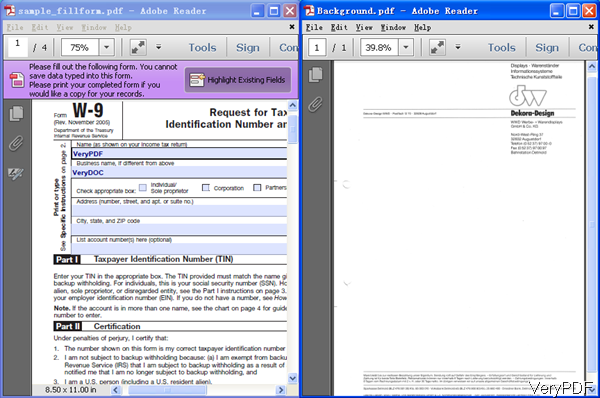 -overlay : use the first page of the background PDF as a watermark and put it over the input PDF. -muloverlay : put each page of the background PDF over the corresponding page of the input PDF. Now let us check overlay PDF effect from the following snapshots. During the using, if you have any question, please contact us as soon as possible. This is from the input PDF. This is from output PDF. We perform a PDF concatenation, multiple PDF’s into one larger PDF. Which tool(s) are required for that? How to combine two PDF pages into one single PDF page? How to use -underlay option in pdftoolbox software? How to overlay PDF to another PDF? We perform a PDF concatenation, multiple PDF's into one larger PDF. Which tool(s) are required for that? This entry was posted in PDF Toolbox Command Line and tagged overlay PDF. Bookmark the permalink.